Born in Sardoi, Gujarat. Member, Senate of SNDT University, Bombay. 1944-49 Diploma in Painting, J.J. School of Art, Bombay. 1952 Group exhb., Bombay Art Society, Bombay. 1954, 64, 75 Solo exhb., Jehangir Art Gallery, Bombay. 1955, 56, 57, 58 National Exhb., Lalit Kala Akademi, New Delhi. 1957 Annual Exhb., Academy of Fine Arts, Calcutta. 1967 Solo exhb., Couturier Gallery, Stamford. 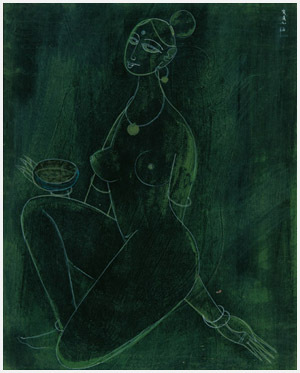 1971 Solo exhb., Taj Art Gallery, Bombay. 2005 Manifestations III, organised by Delhi Art Gallery, Nehru Center, Mumbai and Lalit Kala Akademi, New Delhi. National Gallery of Modern Art, New Delhi. Lalit Kala Akademi, New Delhi. Chandigarh Museum, Punjab. Glenbarra Art Museum, Hemeji. Received J.J. Scholarship to study mural painting, Bombay. 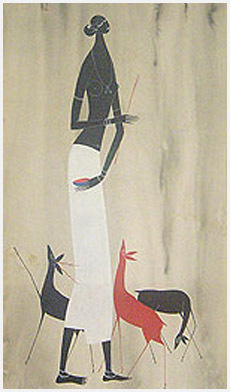 1952 First Prize in Indian Style Painting, Bombay Art Society, Bombay. 1955, 57 National Award, Lalit Kala Akademi, New Delhi. 1957 Award, Academi of Fine Arts, Calcutta.